A naturalist's paradise, this B&B is known for it's stunning gardens, waterfalls and ponds. En-suite spa services and pet friendly. You'll feel like you're vacationing on your own private ranch at this countryside retreat. Private cottage or BandB rooms. Available for weddings. All rooms at this quaint inn have full or partial ocean views and full kitchens. Cook dinner over an open fire on the beach and watch the moon rise. Relax with oceanfront views, in front of romantic fireplaces or stroll through the beautifully maintained grounds of Colette's BandB. Located on 10 acres of lush gardens with sweeping ocean views, the Domaine Madeleine offers idyllic romantic getaways with 5 luxurious guest rooms and delicious breakfast. Wander through the beautiful gardens or along the private beach or hike the Dungeness Spit. Rest, rejuvenate and enjoy farm to table breakfast. Your ideal vacation starts here. Relax in your inn room or private family suite. Enjoy the company of the inn's many pets and the visiting wildlife. Luxurious lodging with private baths and mountain and ocean views. Enjoy afternoon tea, English-style tea and enjoy being treated as royalty. With views of snow-capped mountains, this log home is the only BandB on the Elwha River. Close to hiking trails and outdoor activities. BandB rooms; cabins. Sitting on a lavender farm overlooking the Strait of Juan de Fuca, this high-end inn boasts deluxe suites, gourmet coffee and delicious breakfasts. A beautiful, French style BandB located on 2.5 quiet acres in Port Angeles, WA. Free Wi-Fi, jetted tubs and activity booking. 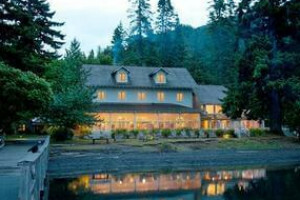 Upscale and refined accommodations, minutes from the entrance to Olympic Nat'l Park and beautiful beaches. Chose from private cottages or BandB suites. Situated on 10 acres of costal rainforest, this classic lodge-style inn has beautiful guest rooms or camp sites. A large fireplace welcome guests. Walk to town for a night out or a day of shopping from your inn suite or private cabin. Guests enjoy a daily continental breakfast. Nestled on a ridge in the rain forest in Forks WA, just outside Olympic National Park, choose from 4 classically decorated guest rooms and a variety of yummy breakfast items. For a unique vacation, stay at the New Dungeness Lighthouse for a week and serve as the lighthouse keepers. Or take one of the free, daily tours. A luxury BandB perched on the bluffs over the Strait of Juan de Fuca. Spacious guest rooms with fireplaces and jacuzzis. Breakfast and picnic lunches to go. Warm hospitality at this 5-bedroom Port Angeles BandB. Beautiful gardens, friendly hosts, complimentary rides to the ferry. Packages and specials offered. This luxury BandB is nestled on 20 acres of sprawling meadows, surrounded by tall conifers. Tour the vineyard on site and enjoy high-end, gourmet cuisine.